Been a while huh? Well I'll do a quick recap on the last year without boring you too much. I've been working for a living (how dreadful) in South Korea in a city called Wonju. The lonely planet refers to Wonju as "possibly the worst city in Korea" but I have to disagree. It's a small place with around 200,000 people. Plenty of shops, good restaurants and places to hang out. The nightlife lacks a bit with no real clubs but you can always find a good place to go to pass the time until the sun rises. If you ever do find yourself in Wonju then I highly recommend Family Mart drinking. This is a highly complex social and cultural gathering in which you congregate near a family mart with friends and consume large quantities of an alcoholic beverage known as soju. This is usually combined with beer to create someck. During this gathering it is expected that you talk crap for hours on end, do not leave before sunrise and occasionally try to converse, in konglish, with the locals. Memories of that kind of summer night in Wonju will be my everlasting memory of Korea. I did teach English, at various levels, for 5 days a week. Sometimes the lessons were great and had some really good banter with the kids and other times I would spend an entire lesson being hit by several very small children. Korea can be a very random place and sometimes the things that happen blow your mind for the absurdity of it. I had a class turn up stark naked because there wasn't enough time for them to change after swimming lessons and everyone seemed to think that this was a perfectly normal way to teach a lesson. I also had one class dressed entirely in Hambo (traditional clothing) and found out on that day that I too would be wearing traditional clothing, cooking at eating traditional food and learning to play the a traditional musical instrument. So yeah... Random... I suppose I love and hate Korea. Sometimes I was driven insane by the quirks but in the end I made some great friends and had some great experiences and really there isn't much more you can ask for in life. Anyway, about 2 weeks ago I left Korea. We all went to Seoul for a proper goodbye. Got truly hammered in the night and said our teary goodbyes the next morning. Going to miss my group of friends more than I will miss the country. We had some great times causing several international incidents. So yeah, after that I spent a night in a hostel feeling incredibly lonely before almost missing my flight the next day. The flight, like many, was long, boring and seriously lacking in entertainment. The only movie was an Indian film with Chinese subtitles. In Edmonton now staying with family. My Uncle Alan, Auntie Anne and their son Bryn. Hopefully I will see Rhys too before I leave. I have been reunited with my bike after about 15 months. 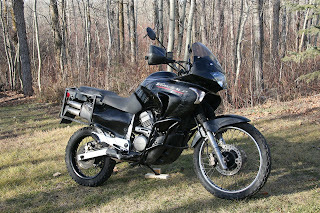 It is in better condition than when I last saw it thanks to my Uncle who is a big bike fan himself. The following two pics are of the bike as it arrived in Edmonton. Tightly packed up for shipping and after (a probably very frustrating) few hours rebuilding. It seems one of the fork seals blew on the trip over so Alan fixed that up, got some new fittings for the faring and windshield which should reduce any rattle and changed some pipes which were leaking. We've also had to adjust the chain which had 118 links instead of 110 so we broke the chain and found out the o-ring chain was two wide for the only masterlink we had available. Correcting this involved taking a grinding tool to one of the sideplates making it a bit thinner and removing the o-rings and the metal loops they sat on. This will be something I will be keeping a very close eye on until the chain is replaced. Finally a new battery fitted and a few nuts n bolts replaced and it appears we are good to go. I'm working out what can stay and what can go when it comes to luggage as there seems to be considerably more clothing now than there used to be plus all my scuba gear. So why haven't I left you ask? Why, with miles and miles of open road ahead of me and all the possibilities, am I sitting inside typing away and staring out the window? 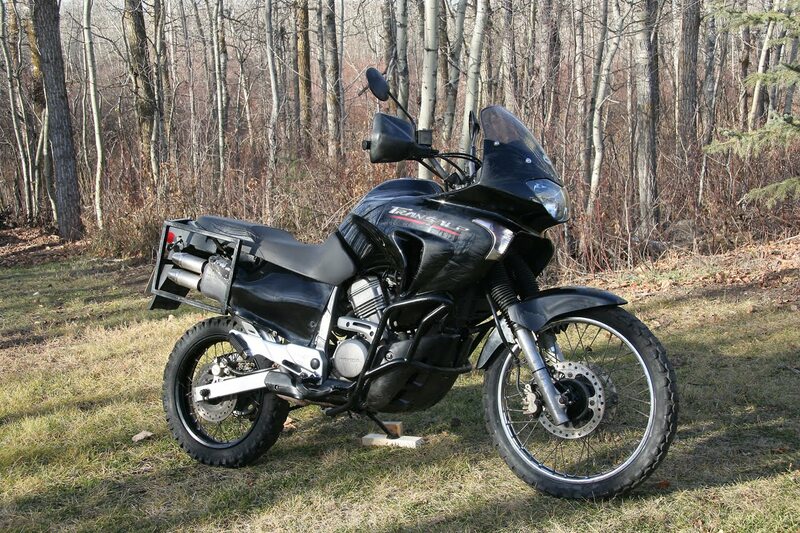 Well, -23 Celsius and 2 inches of snow a day can seriously put a dampener on a bikers spirit. 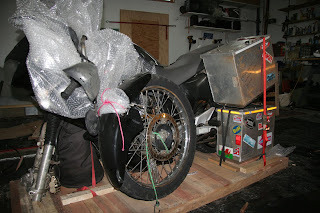 With a little bit of help and a lot of googling I finally found a shipping company who is willing to throw my bike in the back of a truck that is deadheading over to Vancouver. So I'll be on a bus soon enough heading back to Vancouver myself. Should be back on the bike by Monday or Tuesday next week. Excited? Just a tad. Bought a LP for Mexico today and tried to pick up some maps for the US and Central America. Few things left to buy but they can wait till the US where they are a bit cheaper. Should have a GoPro head cam soon and a new netbook to edit the videos. Weekly updates this time around? I can't promise anything but I will try to keep Monday as my posting day and we'll see what happens. Should have videos and photos from the bike this time too. You blow my mind!! You really have the freest of free spirits!! Good luck on your next leg! Good to have a regular life sign from you again. anyways. good start on your next leg of the trip. looking forward to reading on your new adventures and of course the pictures. Hey dude, great that you're back on the road, though obvioulsy Asia is the real choice for such activity! I recently got back in the truck after leaving it for 2 months. I put in a new radiator, and I'm waiting to put a new track-rod end and front springs on. It was -33ºC a few days back in Estonia, but I'm now in Belarus and the temperatures are almost hitting 0 in the daytime. Looking forward to a great summer in Central Asia. Looking forward to hearing from you too, what's the long-term plan? your blog is very nice and has charming theme.